The Hudson Valley of New York has long been a region of incredible winemaking. Not only is it home to the Brotherhood Winery, which stands as America’s oldest winery, this area has pioneered many of the innovations that have helped the wine industry grow and prosper. The wines in the Hudson River region produce superb wines using Native American, French-American and European grape varieties. You’ll find over 57 wineries, 3 wine trails and fantastic events to enjoy all year long. 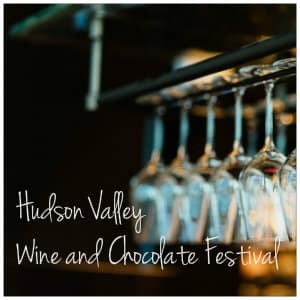 Today we are calling all wine and chocolate lovers for the Hudson Valley Wine and Chocolate Festival. Sip and sample your way through the Hudson Valley Wine and Chocolate Festival, happening November 18, 2018 in Patterson, NY. The venue for this great event is just 45 minutes from our bed and breakfast, down I-84 E and across the river. For guests staying with us, this festival will be a great activity to check out over that weekend. This year the festival is having an “International” theme and you will be met with over 80 vendors from across the region. Chocolate, wine, spirits, cider, craft beer, fine crafts, specialty foods and more! Food trucks will be on site and after you have sampled to your heart’s content you can get a jumpstart on your holiday shopping list! A tasting ticket, which costs $30 ahead of time or $35 at the door, will allow you to taste and sample from all of the vendors and you will also receive a signature tasting glass and drink lanyard. Afterwards, you can come to your suite and snuggle up by the fire with a hot coffee and your favorite book or challenge your loved one to a game of Scrabble or chess in our Game Room. Take some time for yourself to enjoy a relaxing getaway to the Hudson Valley. Our home is perfectly located for those who want peace and privacy and for those who want to be near the action. Our website lists all kinds of things to see and do so check it out!